Dura Ace is the pinnacle range of the Shimano road components. Besides its superb groupset, each level of components also have its own set of wheels and other accessories. I borrowed an old C50 for the spin and see how it feels like. Given that it is Shimano best wheels, I expected highly of it. 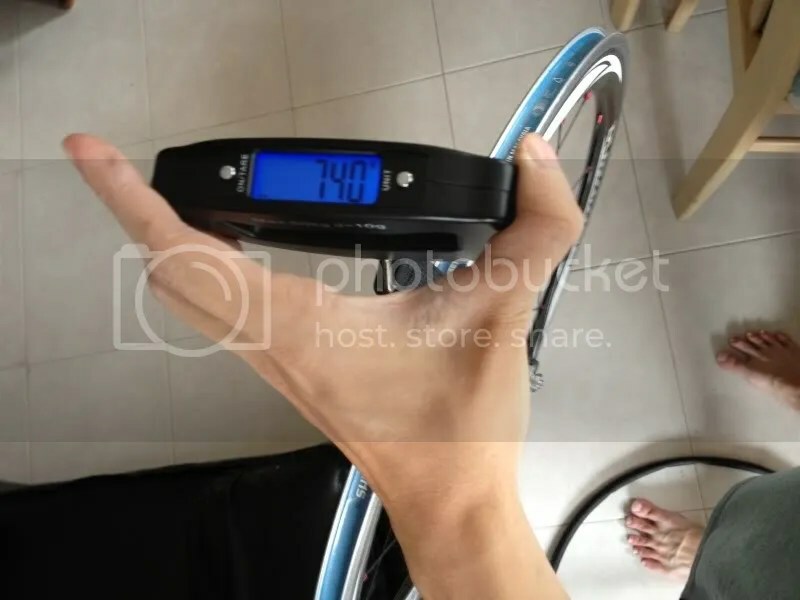 Front Wheel weight, cant weight it on my normal weighing scale as the rim is unable to support on its own on the hubs. 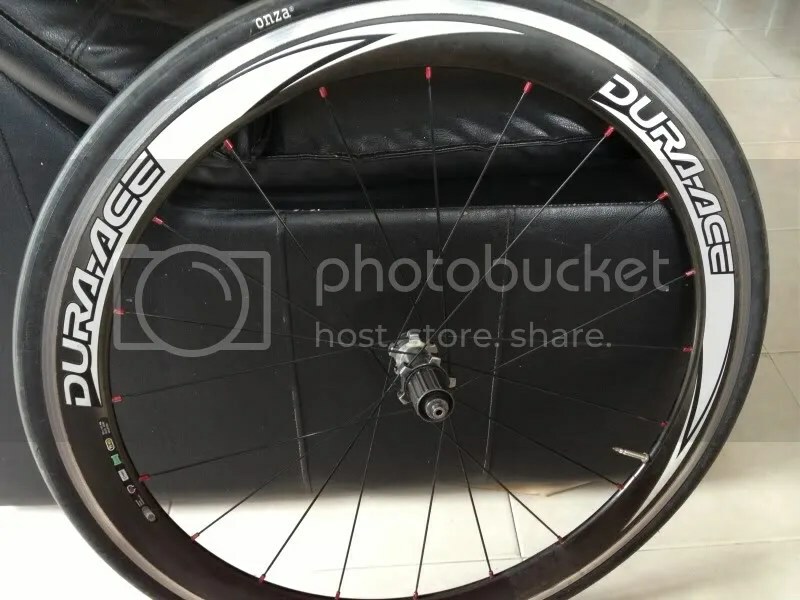 Front wheel with tires, note the blink graphics and the word Dura Ace seems to be everywhere, even on the bearing seals! Aero spokes too help complete the look though its not as “knife” like shape as the other wheels that i used. Rear wheel with tires and everything on. This is perhaps the more important part, how does it feels ? To provide comparsion, I used the same cassette from that of my Fulcrums and used back the same tires which are GP4000s.I rode around 400 km with it on group rides as well as to commute to school. 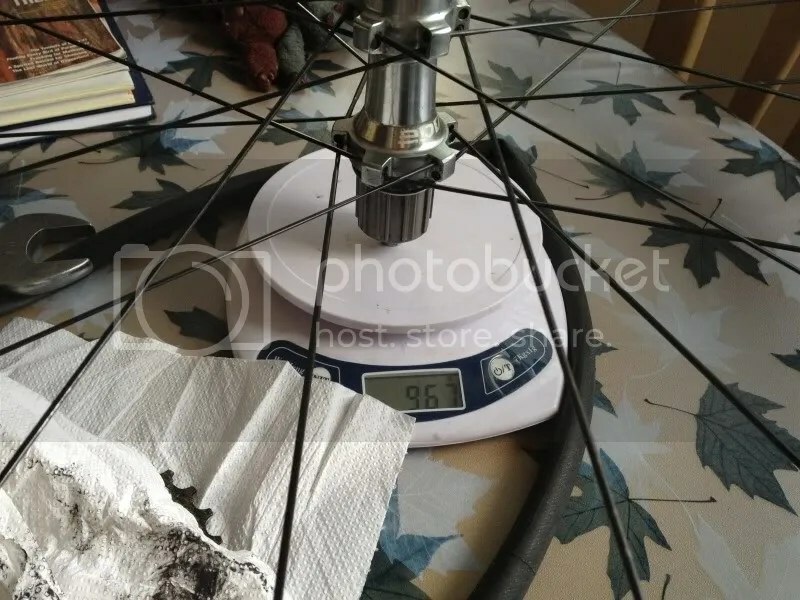 Having come down from a ceramic bearing low profile wheelset to an aero high profile but steel bearings wheelset, I find that the heavier weight meant that it keeps speeds better. In the group rides, I find it easy to cruise inside at >40 kph. Out of it 38kph for cruising is normal. While it may not be ceramic bearings, the bearings are the old cup and cone style but they are GOOD. I do not sense much difference. It is heavy to power up the wheel but once up to speed it feels okay. While there might be some problems with crosswinds as it is rather deep profile wheelset, but for those intending to use these wheels on their Time trial/Triathlon bikes, it is not to the extend to the point of no control. It performed well, even in 20kph crosswinds. I highly doubt the “aeroness” of these wheels though I felt that these wheels are able to keep speed better in a blind test. 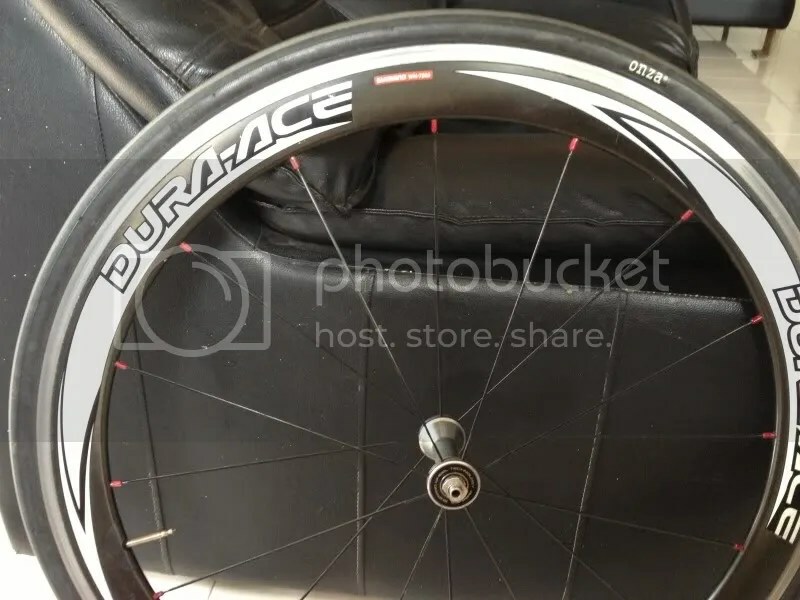 The rim does not have any dimples like zipp, nor the toroidal profile of HED, however the price of this wheels first hand is way cheaper than that and the saving grace is the excellent Dura Ace Hub. Of special note is that the wheels are really bombproof. I have commuted to school with it, going through roads with construction, pot holes and big drain covers and there was no puncture, nor did the wheel come out of true. Heavy wheel, bombproof and excellent hubs, what is not to like about the wheels ? It may well suits the need of a commuter who wants to look flashy, or the weekend warrior who will like to deep depth. The black and white graphics suit most bikes though you cannot run campagnolo groupset with this wheelset. This entry was posted in Reviews, Shimano and tagged aluminum rim, clincher, dura ace, Dura Ace C50, steel bearings. Bookmark the permalink.